The center of the square brings me back to a much more developed political memory. A few months after April 11, a very weird phenomenon began. It was called the “civic military resistance” or something like that. Basically consisted of a huge group of very important military people gathered on Altamira square and saying that they were against the president; and in a civic way they would make Altamira square a “free territory”.I never quite understood the movement that surprised me in my first years of the university, but after that and for a few months in a row, some days more than others people went to that square to show support to those soldiers. They even installed a clock that kept track of the days the “resistance” was there. I decided to go one day after class, like three days after everything started. Took the subway, reached the square, and stood a few meters away from the platform hearing the speeches. In one pocket of my bag pack, along with some books and stuff, I had my cell phone and my wallet. Since I was so distracted hearing the speeches, I did not notice that someone opened my bag and took stole my cell phone and my wallet under my nose. After I got tired of hearing the speeches, I randomly walked throughout the square, lost in my thoughts. Then, in one side of the square I found my mom and my sister crashed into tears next to a police patrol. They looked at me as they would look a death person coming back to life. Some strange woman also approached and asked me if I was ok. I didn’t got what was going on until my mom told me that she called to my cell phone and a man picked it up and he said he kidnapped me and he was going to kill me, since he hated “oligarchs” (mainly a word used by Chavez to call the people against him since the very early years of the regime). My mom ran to the police and gave them her cell phone, the police called again and the guy told them the same story. Then, the police sent a message to the ex- military standing on the platform and they started to call me from there. But between the noise and the fact that I was very distracted, I didn’t hear anything. When the man who had my cell phone realized of the gravity of his joke, he said he didn’t steal my cell phone; he only found it and that he started joking because he was a “chavista” (Chávez supporter) and he had a girlfriend who lived just near by the square; so he was tired of the traffic and the noise caused by the protest of a bunch of “oligarchs”. After that he gave us his address. My mom, after arguing with me obviously, for being so naïve and distracted, threw away the address. I felt very angry afterwards: my cell phone was very cheap and old, I couldn’t even write text messages with that cell phone. And I didn’t have much money in my wallet. Not more than what you could use for buying a bottle of water or something. But I had other things: a picture of my grandmother and what was even more important: my old Venezuelan ID, with my 10 year old face and signature and the inscriptions above “República de Venezuela”. Sigh… when my country was only República de Venezuela and not República Bolivariana de Venezuela. When my country was truly mine. And I don’t even have the ID that proves it and I still don’t know if I was a victim of common delinquency or of an incipient political resentment. I wouldn’t be paranoid if I choose the second hypothesis. Two months after that, the meetings at Altamira square stopped being peaceful and the square became a very dangerous place as we never pictured it before. We saw on TV, how a man entered the square and just started shooting against the people, leaving three people dead and many more wounded as a result. So the woman I called “the woman of the shape”(read the first part of this story), wasn’t the first, nor the only one who spent their last hours there; but she’s the only who has “a shape”. Those victims were the light that kept turning on the fire of three long months of the recent political history of my country, what it has been called The General Strike. As the bus arrived, the man with the deep look and rough face because of the people passing by over the shape and myself, forgot a little bit about it and paid the bus ticket, going back to our routines. 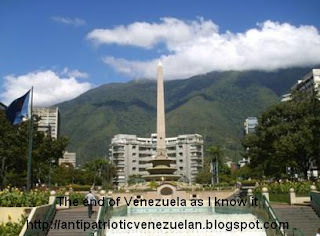 The square looked calm and beautiful from my window: always clean (something unusual in Caracas), with a huge obelisk in the center, and the Avila (a big mountain, national park and very meaningful place for the “caraqueños”) above. The elegant stairs that leaves you to the subway couldn’t tell me about the people who hide there many times from the shootings. And the many events in my presence (cause I only told three stories so far from much more) during my political socialization, that is has been developed in that square. I couldn’t tell if it was really a place for freedom, or has lost a lot of the old political magic but it is certainly a place for trying to be free while a devoted husband spends two years so far, carefully marking the place where he lost his wife; that could be my mom, or even me. And even knowing that: People just pass over the shape and keep moving on with their lives as they normally do. Ps: Sidenote made on October, 2008: the sidewalks of the square were repaired, so the trash can it’s in the same spot but not the shape of the woman that made me write this three part story in the first time.